This is a made to order item. Production time will vary from 2 to 6 weeks. Spot clean only with a water-free cleaning solvent. 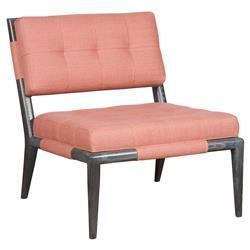 Lovely coral pink linen upholstery pops against the dark mink wood frame of this lounge chair. The simple armless silhouette has an effortlessly elegant feel, putting the focus on the gorgeous finishes. Sure to become a favorite seat in the house, Hattie is the epitome of breezy coastal style.